^ a b Time: Disasters that Shook the World. Time Home Entertainment. (2012). p. 56. ISBN 1-60320-247-1. ^ Ruffman & Howell 1994, p. 276. ^ a b Armstrong 2002, p. 42. ^ Mac Donald 2005, p. 5. ^ Flemming 2004, p. 9. ^ Flemming 2004, p. 11. ^ Fingard, Judith; Guildford, Janet; Sutherland, David (1999). Halifax: The First 250 Years. Formac Publishing. p. 98. ^ Bird 1995, p. 36. ^ Armstrong 2002, pp. 10-11. ^ Johnston, William; Rawling, William; Gimblett, Richard (2011). The Seabound Coast. Dundurn Press. p. 96. ISBN 978-1-55488-907-5. ^ Armstrong 2002, pp. 9-11. ^ Flemming 2004, p. 13. ^ Bird 1995, pp. 37-38. ^ Armstrong 2002, pp. 10, 14. ^ Tennyson, Brian; Sarty, Roger (1998). “Sydney, Nova Scotia and the U-Boat War, 1918”. Canadian Military History 7 (1): 29-41. ^ Kitz & Payzant 2006, pp. 12-13. ^ Kitz & Payzant 2006, p. 12. ^ Kitz & Payzant 2006, p. 13. ^ Mac Donald 2005, pp. 9-10. ^ Mac Donald 2005, p. 8. ^ a b Scanlon, Joseph (2000-10). “Sources of threat and sources of assistance: the maritime aspects of the 1917 Halifax Explosion”. The Northern Mariner X (4): 39-50. http://www.cnrs-scrn.org/northern_mariner/vol10/tnm_10_4_39-50.pdf. ^ a b c Kitz & Payzant 2006, p. 16. ^ a b c d e f g Lilley, Steve (2013-01). “Kiloton killer”. System Failure Case Study (NASA) 7 (1). http://nsc.nasa.gov/SFCS/SystemFailureCaseStudyFile/Download/296. ^ Flemming 2004, p. 18. ^ Flemming 2004, p. 16. ^ Mac Donald 2005, pp. 19-20. ^ Armstrong 2002, p. 34. ^ Armstrong 2002, pp. 32-33. ^ Flemming 2004, p. 23. ^ Mac Donald 2005, pp. 30-31. ^ a b Flemming 2004, p. 24. ^ a b Kitz & Payzant 2006, p. 17. ^ Mac Donald 2005, p. 33. ^ Mac Donald 2005, pp. 15–19, 27. ^ Flemming 2004, pp. 17, 22. ^ Armstrong 2002, p. 32. ^ Mac Donald 2005, p. 32. ^ Kitz 1989, p. 15. ^ Mac Donald 2005, p. 38. ^ Mac Donald 2005, p. 39. ^ Mac Donald 2005, pp. 40-41. ^ a b Flemming 2004, p. 25. ^ Kitz 1989, p. 19. ^ Kitz 1989, pp. 22-23. ^ Mac Donald 2005, p. 49. ^ Flemming 2004, pp. 25-26. ^ Mac Donald 2005, p. 46. ^ Mac Donald 2005, pp. 50-51. ^ Mac Donald 2005, p. 58. ^ Ruffman & Howell 1994, p. 277. ^ Mac Donald 2005, p. 62. ^ a b Kitz 1989, p. 25. ^ Mac Donald 2005, p. 63. ^ a b Mac Donald 2005, p. 66. ^ Krehl, Peter (2007). History of shock waves, explosions and impact a chronological and biographical reference. Springer. p. 459. ISBN 978-3-540-30421-0. ^ Kitz 1989, p. 26. ^ Armstrong 2002, pp. 42-43. ^ Flemming 2004, p. 47. ^ Gilmour 2001, p. 119. ^ a b Kitz & Payzant 2006, p. 21. ^ Mac Donald 2005, p. 71. ^ Kitz & Payzant 2006, p. 43. ^ a b c Smith, Douglas (November-December 1992). 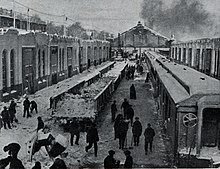 “The Railways and Canada's Greatest Disaster: The Halifax Explosion, December 6, 1917”. Canadian Rail (431): 202-212. ^ Mac Donald 2005, pp. 1-3. ^ Flemming 2004, pp. 53-55. ^ Kitz 1989, p. 53. ^ Kitz & Payzant 2006, p. 73. ^ Glasner 2011, p. 30. ^ Larzelere, Alex (2003). The Coast Guard in World War I: an Untold Story. Naval Institute Press. pp. 74, 79-80. ISBN 978-1-55750-476-0. ^ a b Mac Donald 2005, p. 70. ^ Armstrong 2002, pp. 28-29, 68. ^ Armstrong 2002, pp. 57-58. ^ Armstrong 2002, pp. 58-59. ^ Mac Donald 2005, p. 100. ^ a b Flemming 2004, p. 58. ^ Armstrong 2002, p. 60. ^ MacMechan & Metson 1978, pp. 42-43. ^ Kitz & Payzant 2006, p. 31. ^ Kitz & Payzant 2006, p. 32. ^ Kitz 1989, pp. 64-65. ^ MacMechan & Metson 1978, p. 42. 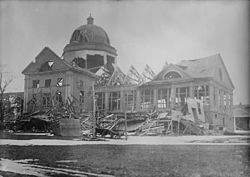 ^ “Disasters in history: the Halifax Explosion of 1917”. The Newsletter of the Child & Family Disaster Research Training & Education Initiative 4 (3): 9-12. (Fall 2008). http://www.oumedicine.com/docs/ad-psychiatry-workfiles/allthedrt_fall_2008.pdf?sfvrsn=2. ^ a b Kitz & Payzant 2006, p. 62. ^ Flemming 2004, p. 67. ^ Kitz 1989, p. 60. ^ Mac Donald 2005, p. 234. ^ Armstrong 2002, p. 213. ^ Kitz & Payzant 2006, p. 109. ^ Kitz & Payzant 2006, p. 87. ^ a b Remes, Jacob (2014). “Mi'kmaq in the Halifax Explosion of 1917: Leadership, Transience, and the Struggle for Land Rights”. Ethnohistory 61 (3): 445-466. doi:10.1215/00141801-2681732. http://ethnohistory.dukejournals.org/content/61/3/445.abstract 2016年7月12日閲覧。. ^ Kitz & Payzant 2006, p. 88. ^ a b c d Hebert, Michelle (March-April 1996). 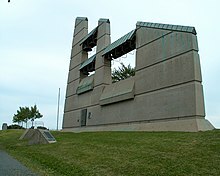 “Building the old new order: Halifax in the wake of the great explosion”. New Maritimes 14 (4): 4-15. ^ Glasner 2011, p. 123. ^ a b MacMechan & Metson 1978, p. 143. ^ Armstrong 2002, p. 113. ^ Graham, Gayle; MacDonald, Bertrum (2014). “The Halifax Explosion and the spread of rumour through print media, 1917 to the present”. Journal of the Royal Nova Scotia Historical Society 17: 92. ^ a b c Flemming 2004, p. 71. ^ Johnston, William; Rawling, William; Gimblett, Richard; MacFarlane, John (2010). The seabound coast. Dundurn Press. pp. 525-526. ISBN 978-1-55488-908-2. ^ Armstrong 2002, pp. 113-114, 122. ^ a b Armstrong 2002, p. 187. ^ Mac Donald 2005, p. 270. ^ Armstrong 2002, pp. 196-201. ^ Kitz, Janet (2002). “The Inquiry into the Halifax Explosion of December 6, 1917: the legal aspects”. Journal of the Royal Nova Scotia Historical Society 5: 64. ^ Flemming 2004, p. 73. ^ Flemming 2004, p. 74. ^ Kitz & Payzant 2006, p. 53. ^ Flemming 2004, pp. 80–81. ^ a b Flemming 2004, p. 81. ^ Kitz & Payzant 2006, p. 56. ^ Armstrong 2002, p. 98. ^ Armstrong 2002, p. 99. ^ Armstrong 2002, p. 105. ^ Armstrong 2002, pp. 108-110. ^ Ruffman & Howell 1994, p. 266. ^ a b Allen, Victoria (2011-07). “Barometer rising”. JOGC 33 (7): 693-694. ^ Goldbloom, Richard B. (1986-05). “Halifax and the Precipitate Birth of Pediatric Surgery”. Pediatrics 77 (5): 764. PMID 3517802. http://pediatrics.aappublications.org/content/77/5/764.abstract. ^ Flemming 2004, pp. 91-92. ^ Williams 2009, pp. 78, 81-85. ^ Veinot 2007, p. 1. ^ Veinot 2007, pp. 19–20. ^ Campbell, Mark (November 1993). 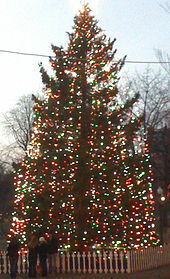 “Tree Expert Picks Province's Annual Gift to Boston”. Nova Scotia Magazine: 12. Armstrong, John Griffith (2002). The Halifax Explosion and the Royal Canadian Navy. UBC Press. ISBN 978-0-7748-0891-0. Bird, Michael J. (1995). The Town That Died (Reprint ed.). Nimbus Publishing. ISBN 978-0-7700-6015-2. Flemming, David (2004). Explosion in Halifax Harbour. Formac. ISBN 978-0-88780-632-2. Gilmour, Don (2001). Canada: A People's History. 2. McClelland & Stewart Ltd.. ISBN 978-0-7710-3340-7. Glasner, Joyce (2011). The Halifax Explosion: Heroes and Survivors. James Lorimer & Company. ISBN 978-1-55277-943-9. Kitz, Janet (1989). Shattered City: The Halifax Explosion and the Road to Recovery（英語版）. Nimbus Publishing. ISBN 978-0-921054-30-6. Kitz, Janet; Payzant, Joan (2006). December 1917: Revisiting the Halifax Explosion. Nimbus Publishing. ISBN 978-1-55109-566-0. Mac Donald, Laura (2005). Curse of the Narrows: The Halifax Explosion of 1917. HarperCollins. ISBN 978-0-00-200787-0. MacMechan, Archibald; Metson, Graham (1978). 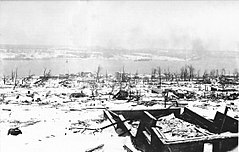 The Halifax Explosion: December 6, 1917. McGraw-Hill Ryerson. ISBN 978-0-07-082798-1. Ruffman, Alan; Howell, Colin D., eds (1994). Ground Zero: A Reassessment of the 1917 Explosion in Halifax Harbour. Nimbus Publishing. ISBN 978-1-55109-095-5. Veinot, Julie Ann (2007). Courting Disaster: The Enforcement of Heteronormativity in Halifax Explosion Romances, 1918–2003. Acadia University. ISBN 978-0-494-31225-4. Williams, David (2009). Media, Memory, and the First World War. McGill-Queen's University Press. ISBN 978-0-7735-7652-0. Beed, Blair (2002). 1917 Halifax Explosion and American Response (2nd ed.). Dtours Visitors and Convention Service. ISBN 0-9684383-1-8. Gilligan, Edmund (February 1938). “Death in Halifax”. American Mercury 43 (170): 175–181. http://www.unz.org/Pub/AmMercury-1938feb-00175?View=PDF&apages=0057. Glasner, Joyce (2003). 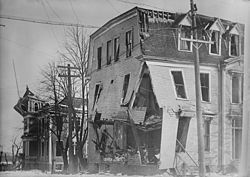 The Halifax Explosion: Surviving the Blast that Shook a Nation. Altitude Press. ISBN 978-1-55153-942-3. Kitz, Janet（英語版） (1992). The Survivors: The Children of the Halifax Explosion. Nimbus Publishing. Laffoley, Steven（英語版） (2014). The Blue Tattoo. Pottersfield Press. Laffoley, Steven（英語版） (2017). A Halifax Christmas Carol. Pottersfield Press. MacLennan, Hugh（英語版） (1941). Barometer Rising. Collins Publishing. ISBN 9780771034893. https://books.google.com/books?id=l7X0MX2yGpwC&lpg=PP1&dq=Barometer%20Rising&pg=PP1. Mahar, James; Mahar, Rowena (1998). Too Many To Mourn – One Family's Tragedy in the Halifax Explosion. Nimbus Publishing. ISBN 978-1-55109-240-9. Maybee, Janet (2015). Aftershock: The Halifax Explosion and the Persecution of Pilot Francis Mackey. Halifax: Nimbus. ISBN 978-1-77108-344-7. Prince, Samuel (1968). Catastrophe and Social Change: Based upon a sociological study of the Halifax Disaster. AMS Press. https://archive.org/stream/catastrophesocia00prinuoft/catastrophesocia00prinuoft_djvu.txt. Remes, Jacob A.C. (2016). Disaster Citizenship: Survivors, Solidarity, and Power in the Progressive Era. Urbana: University of Illinois Press. ISBN 978-0-252-08137-8. Tattrie, Jon (2017). “The Halifax Explosion and the CNIB”. The Canadian Encyclopedia (Toronto: Historica Canada). 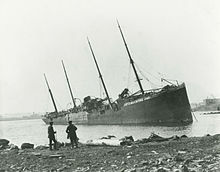 OCLC 21411669. https://thecanadianencyclopedia.ca/en/article/the-halifax-explosion-and-the-cnib/ 2018年4月24日閲覧。. 土屋能男 (2009). ハリファックス大爆発. 19. 火薬学会. pp. 52-56. NAID 10025010389. "Just One Big Mess": The Halifax Explosion, 1917 NFB documentary. Think Like a Historian: The Halifax Explosion Historica Canada video series.